Quick review of Let It Spin. 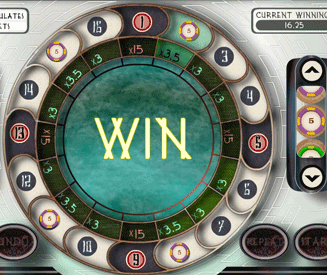 Let It Spin is a pretty unique fixed odds game that is loosely related to the game of roulette. Just like in roulette, you place your bets on certain sections of the wheel. If you guess correctly, you win. However, the segments of the wheel are either black or white. If the light does not land upon your bet but it lands upon a white section of the wheel, you get to play another round for free. 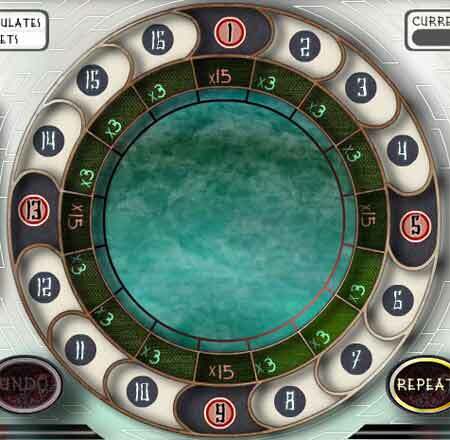 Basically, imagine a game of roulette with a built-in "try again" feature and you’ll be very close to the gameplay of Let It Spin. Let It Spin is fun for a few games. It’s definitely not addictive though. The best part of the Let It Spin online game is the fact that it’s so unique. On top of that, you feel as though some moderately-sized wins are far from unattainable, so winnings a nice chunk of money isn’t far from your grasp. There’s also a slight amount of tension thrown in to the mix for good measure. However, Let It Spin doesn’t really excel at anything. The potential wins are moderate, the tension and excitement is nothing special and gameplay is alright. It’s a clever effort, but not one that’s going to keep you coming back for more. How to play Let It Spin. Place your bets on any of the 16 segments of the wheel. You can bet on both the black or white segments. If the lights lands upon your bet, you win. If the light lands upon a white segment (regardless of whether you have bet there or not), you get to spin again and the win multipliers increase. If the light lands on a black segment, the game is over. You can add more bets in any given round to an empty number. You cannot wager more on any existing bets in the current game however. I’ve almost certainly confused you even more with this short description of how the Let It Spin game works, so read below for further details on Let It Spin. Let It Spin in more detail. Note: Apologies in advance for my overuse of the word "segment" in this game description. I couldn’t think of a better alternative. 12 white segments. Bets on white segments remain throughout the entire game. 4 black segments. Bets on black segments stand for one round only. You can bet on any of these 16 segments. After you have placed your bets, a light will spin around the wheel before finally coming to rest over one of the segments. You are entitled to another spin of the wheel. The payout multiplier for all your current bets increase by 0.25. You will also be paid for any winning bets. These will be added to your winnings pot and cannot be lost. There is no option to "collect" any winnings because your winnings are saved and you keep playing until you finish on a black segment. You will also be paid your winnings if you had bet on this black segment. These will be added to your current winnings pot and the game is over. If you did not bet on the black segment and you hadn’t won any money up to this point, you finish the game with nothing. Any black segment = 15x. Any white segment = 3x. If you bet on a white segment, the multiplier will increase by 0.25x for every successive round that a white segment is selected until the light falls upon a black segment. The longer you play for, the more the multipliers will grow and the greater the payout will be when the light lands on one of your bets. As far as I’m aware, there is no limit to how big the multipliers on white sections can get. If you're lucky, Let It Spin can become pretty lucrative.